I really want a dSLR camera. This morning while working in the herb garden a family of robins came to check on my progress. I had lots of opportunities to get a good photo, but my point and shoot camera took so long to focus that the birds got tired of posing. The photos ended up being blurred. Finally one of the babies sat down in the grass. He sat still until I was able to focus and get a good photo. Isn’t he cute with his fluffy red breast? 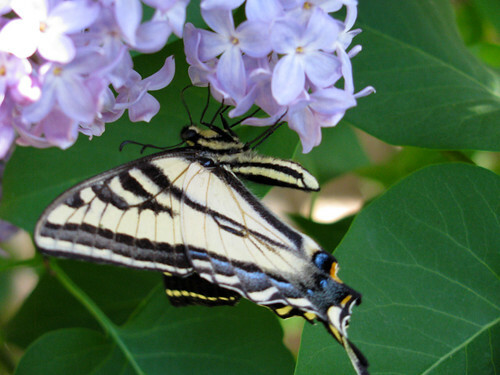 Then a yellow swallowtail butterfly came to visit the lilac bush. It was more interested in the blossoms than me and I was able to get up close with the macro setting. Since it was windy and the wings kept flapping I again needed more time for the camera to focus. I was able to get one photo that is almost clear. A couple of California quails stopped by too, but they didn’t stay long enough for me to pick up the camera. They are really cute birds with curly-cues on top of their heads. Maybe the next time they visit I will have the camera handy. 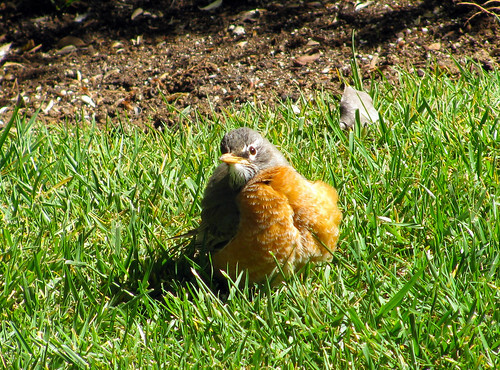 Now if I can just get them to sit still like the baby robin…. This entry was posted on Tuesday, April 21st, 2009 at 3:00 am and is filed under Garden and Photography. Tagged: Garden, Photo. You can feed this entry. You can leave a response, or trackback from your own site. Oh – what a great shot of the baby robin! I completely understand the frustration with the delay in a point & shoot shutter. One in a million gets it right, and it looks like you got two! Thanks for sharing your garden photos.